In 2007 I went with some friends to Barcelona in Spain for a short holiday in the middle of April, because we got some cheap tickets with SkyEurope. 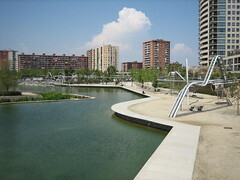 One day we spent in the new development area „Parc Diagonal Mar“ which is near the North-Eastern end of Avinguda Diagonal, a road which runs all through Barcelona diagonally. It’s an area near the seaside and was used by former textile industry, which went down during the last century. Now it’s a very modern area for housing, with a big green area, lakes and some modern art, looking like a roller coaster track. This entry was posted on Dienstag, Februar 16th, 2010 at 22:40 and is filed under Uncategorized. You can follow any responses to this entry through the RSS 2.0 feed. You can leave a response, or trackback from your own site.